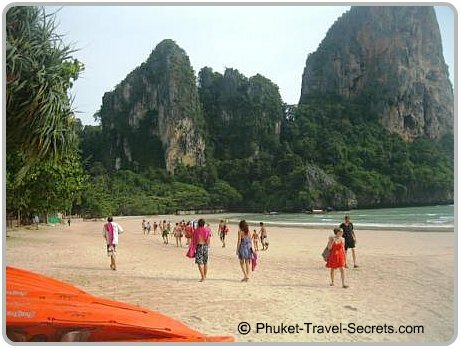 West Railay Beach also known as Railey Sunset Beach is the most popular beach within the peninsula. West Railay is located between Ton Sai and Phra Nang Beaches on the west coast of Krabi. The beach is wide and framed at both ends by limestone cliffs, and is by far one of the most popular spots for day trips from Ao Nang. The northern end of the beach is the best spot for swimming, towards the southern end is where the long tail boats arrive to pick up and drop off passengers. Throughout the high season, West Railay Beach is somewhat busy as it is renowned for being an ideal destination for romantic getaways, family beach vacations and has been a long time favorite spot for backpackers and day trippers. In the centre of the beach is Walking Street, a short walkway that is mainly occupied by the Flame Tree Restaurant and Bar which serves real coffee and both western and Thai food. Beyond the restaurant are a few other shops as well as a couple of toilets that are set further back behind the shops. Bars and beachfront restaurants are located within the resort grounds as well as cheap eats that are available from the vendors that walk up and down the beach selling drinks, fruit, ice-creams and corn. 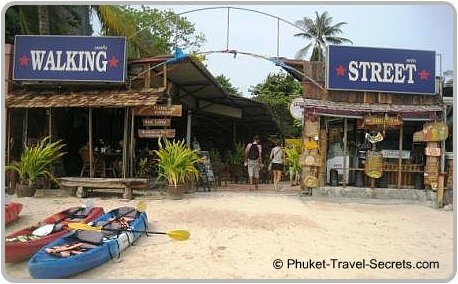 There are many other restaurants and bars located at East Railay. To get to East Railay, follow the paths that run through the resorts or the sandy path through Walking Street. 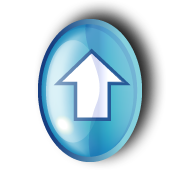 There is a limited selection of resorts and hotels on the beachfront at West Railey, however they are well priced to suit all budgets. 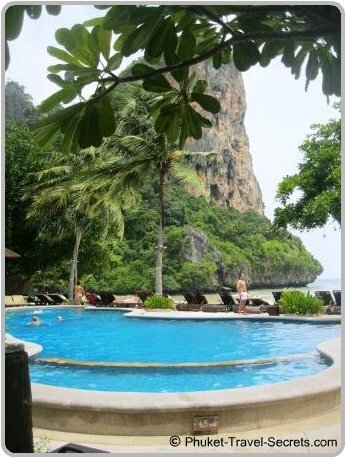 Located at the southern end of the beach is the large and very nice four star Railay Bay Resort. The resort is set in tropical gardens that stretches from West Railay right through to East Railay Beach. A little further down the beach is the 3 star Sand Sea Resort, which boasts a range of bungalows. If your travelling with kids the 4 star Railay Village Resort is a top spot for family vacations. 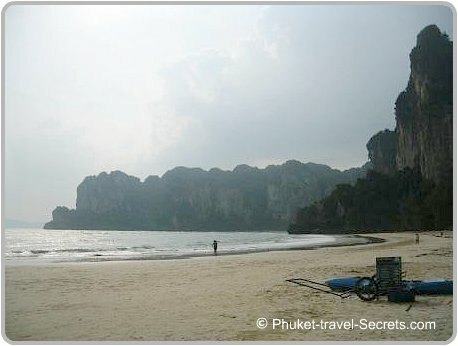 Accommodation on West Railay Beach is generally more expensive than what you can find at East Railay. Apart from island hopping to the nearby offshore islands, the main activities at West Railay are sunbathing, swimming and snorkeling, kayaking and rock climbing. Sea Kayaks can be rented from along the beach; prices vary depending on how long you want to rent them for, from 200 baht an hour up to 800 baht for a day. Fins and masks can also be rented for 50 baht each. 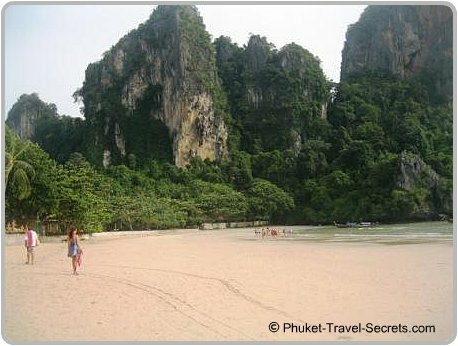 Find out what other travelers have to say about Railay Beach on TripAdvisor.